Want to impress or make a cake for an event? 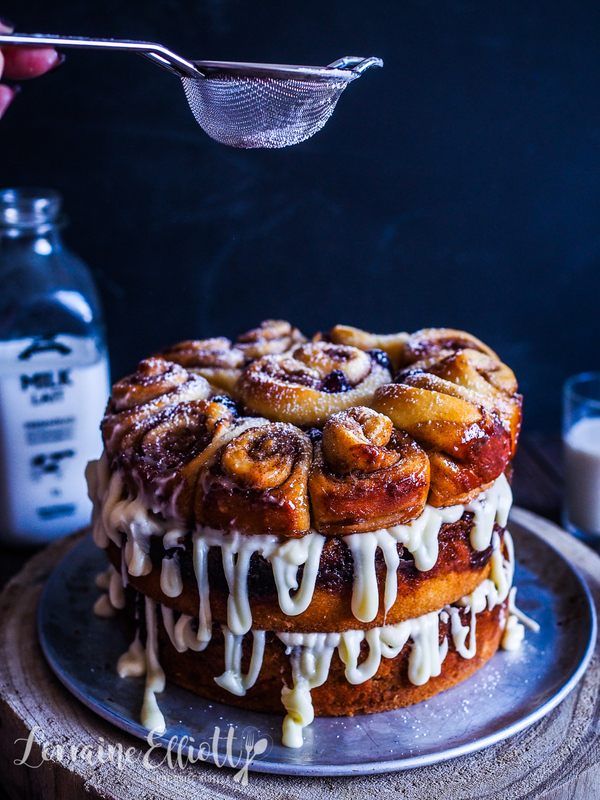 May I offer you this cinnamon roll cake? 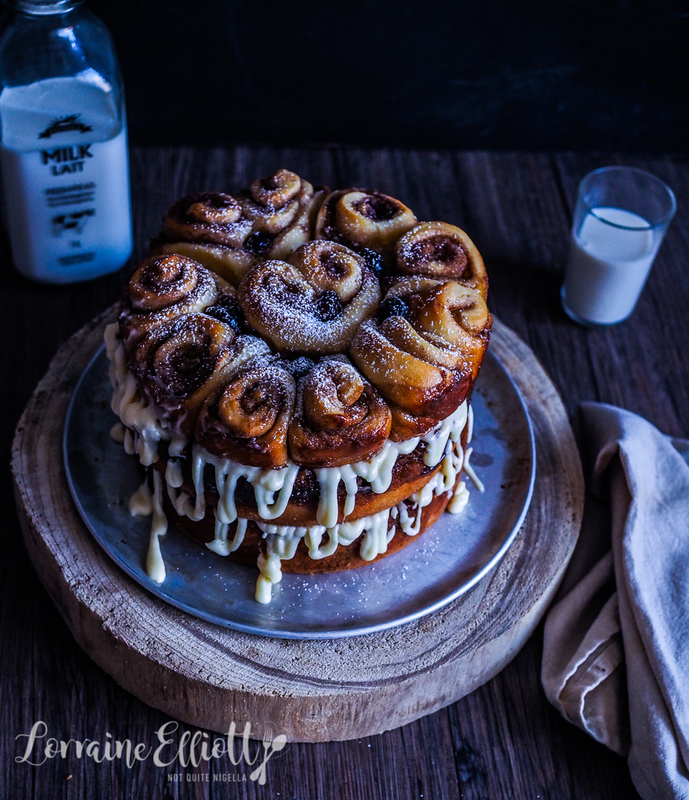 There are two bottom layers of cinnamon roll cake with a caramelised butter cinnamon topping. On the top third layer is a round of the softest cinnamon buns. The whole cake is glazed with a browned butter cream cheese frosting. 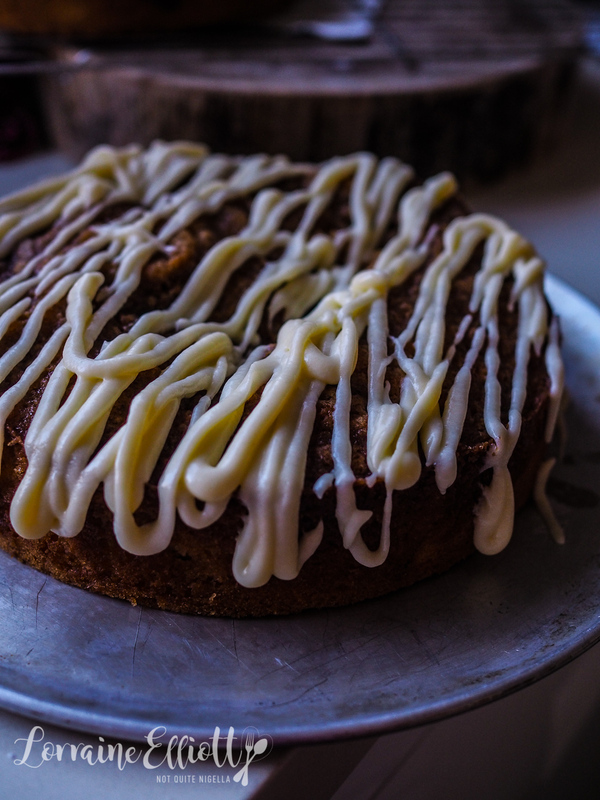 I call this the best of both worlds with both soft buns and cake and makes for a wonderful morning tea cake! I was asked to bake this cake for Mr NQN's work. They didn't specifically ask for this cake but they were doing a bake sale in aid of the drought affected farmers and they asked for a bit of a showpiece cake. Well that was like waving a red flag to a bull. If someone needs something a bit fancy you'll see me emerging from a cake in a full can-can outfit. I love the chance to get a bit fancy and if only I had enough occasions to do so. 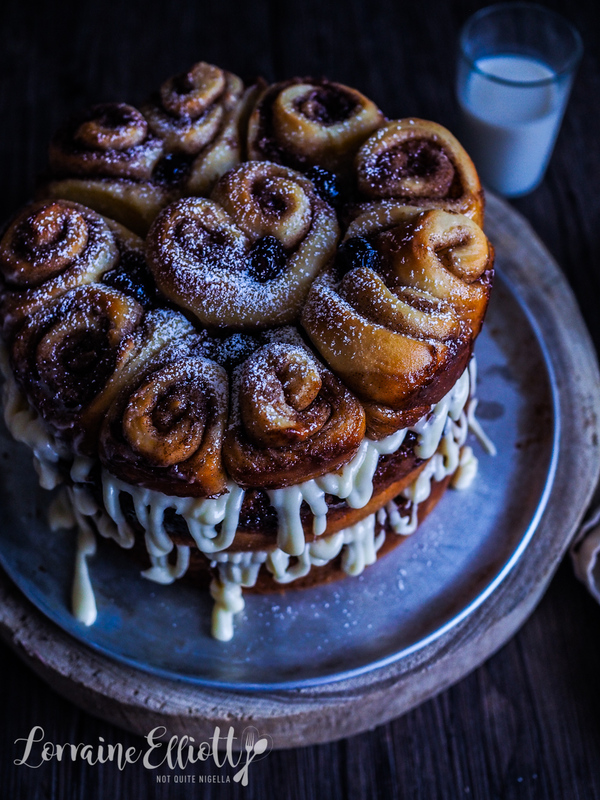 The cake came to mind as I was craving cinnamon rolls, the usual thing for me. And a dear follower on Instagram @chillaxtothemaxwithmycatz messaged me a cake that she loved. She had also given me a great recipe for a jalapeno dip and I knew she loved recipes that were simple but delivered in flavour. 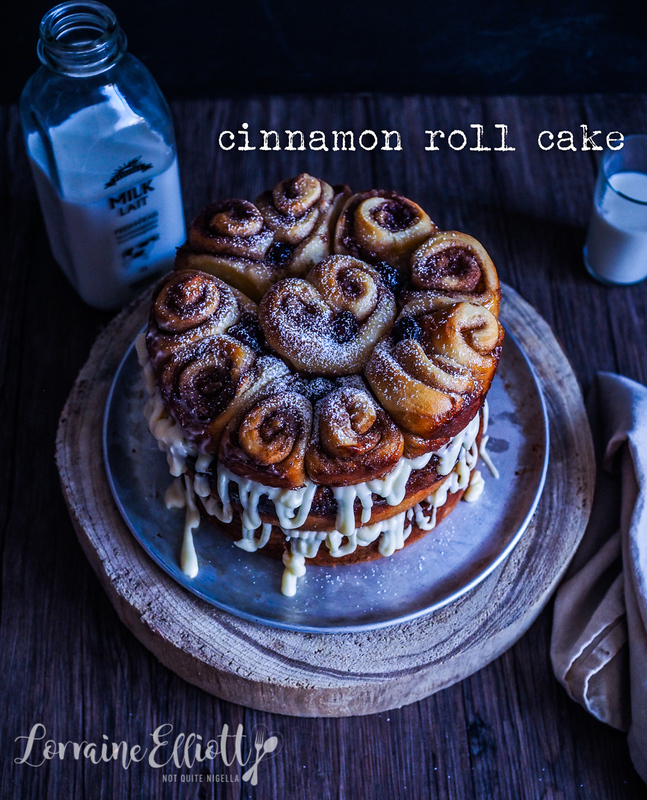 Enter this cinnamon roll cake from Cakescottage. I usually prefer to develop my own recipes but this one looked so good that I had to try it. It's basically a vanilla cake topped with a buttery cinnamon sugar topping. 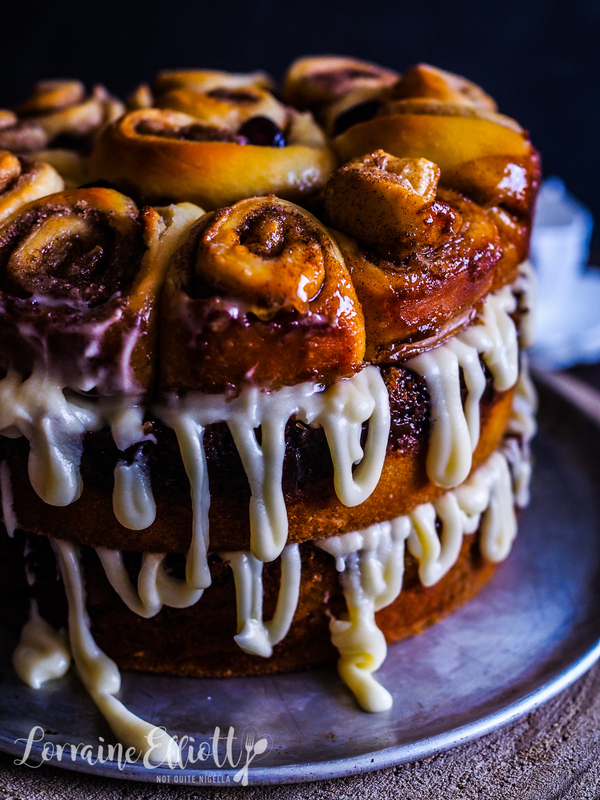 You swirl the two layers together and you end up with this mouth watering topping and two cakes in one. 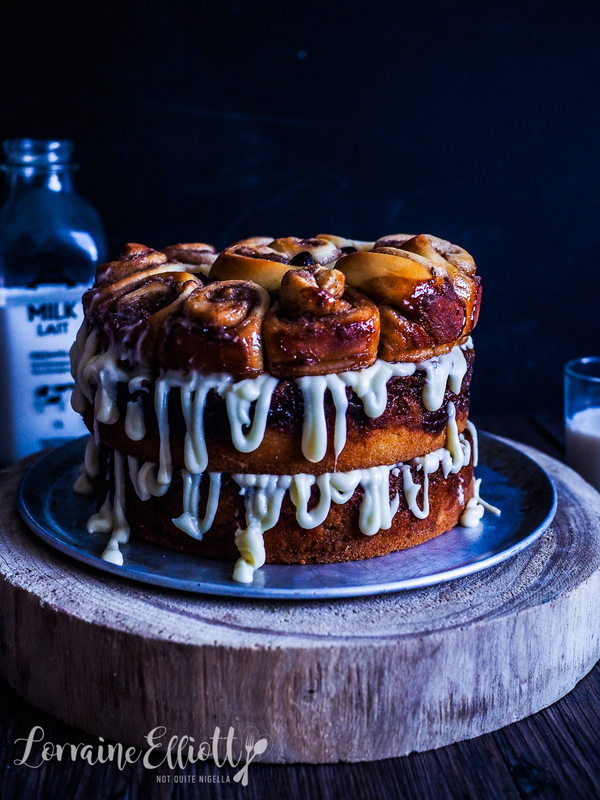 It also tastes like a cinnamon roll but it's not a bread so it suits those that find bread making too much of a challenge. 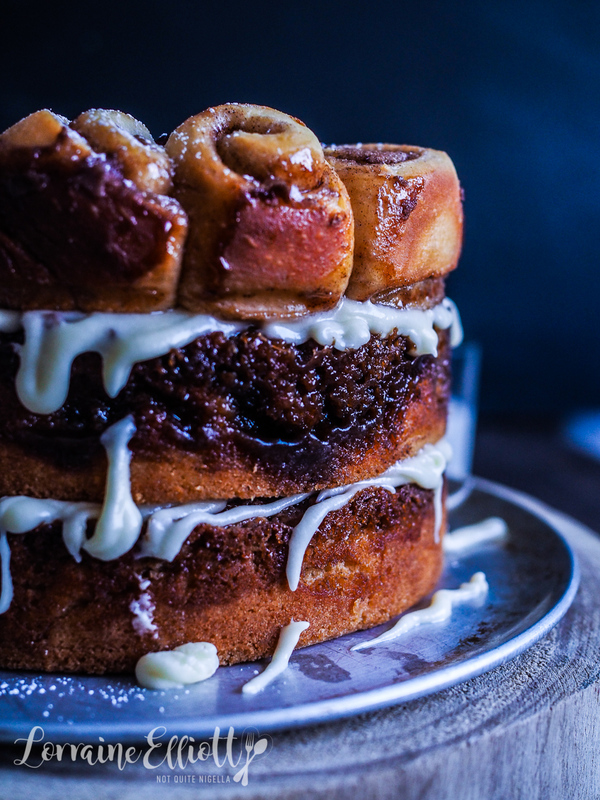 I wanted to make it a cinnamon roll cake but I was having a busy week so I thought I might just make the cake and then pipe the cinnamon roll on top using icing. 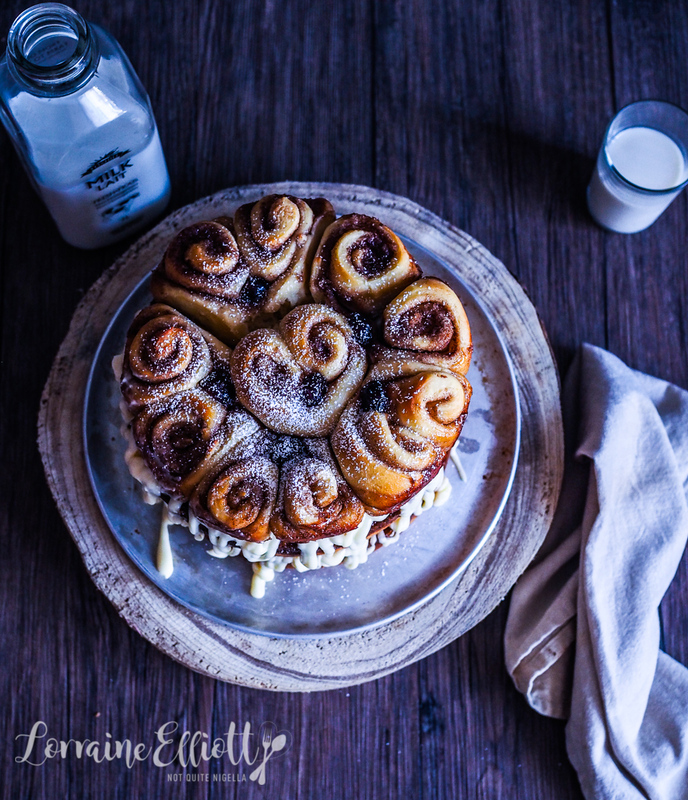 And then it came to me the night before-to use my tangzhong recipe for cinnamon rolls! That would keep the bread fresh because tangzhong or water roux is a miraculous but super easy ingredient that makes bread last longer. They were topped with a browned butter cream cheese frosting. And I'm told that the cake was a real hit. Mr NQN works at a huge fashion company and during the day I got some lovely messages from people about the cake. And they raised thousands of dollars too! So tell me Dear Reader, do you like doing fancy cakes? Do you look for excuses to make cake? Do you often participate in fund raisers as either a baker or a buyer? Step 1 - Preheat oven to 180C/350F and line two 20cm/8inch round tins. In a large bowl whisk the flour, baking powder and salt. In a jug whisk the butter, eggs, sugar and milk. 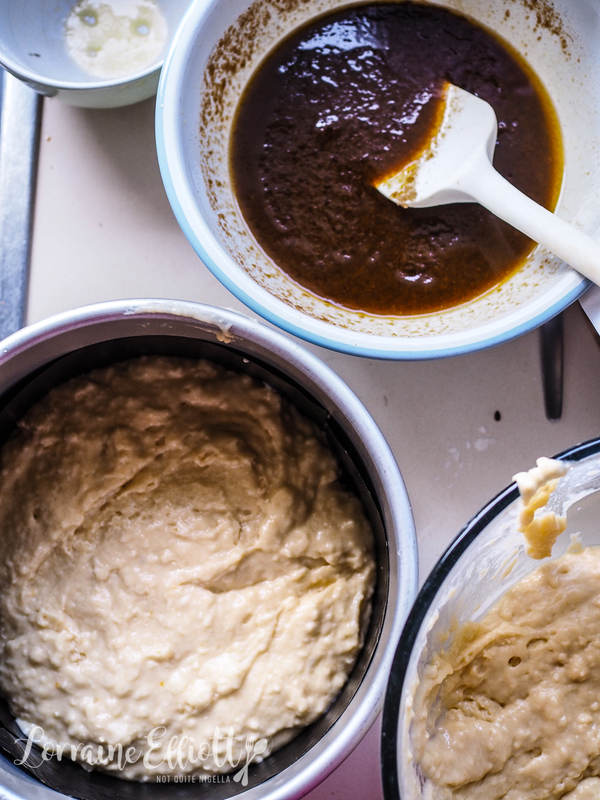 Make a well in the centre of the flour and add the liquids, making sure not to overmix. Divide evenly in the two tins. Step 2 - Mix the top layer ingredients together (butter, brown sugar, flour and cinnamon). Spread on top of the base batter and then using a fork swirl the two batters. Bake for 30-35 minutes. Step 3 - Make the cinnamon bun top layer. Use this recipe for cinnamon buns but halve the quantity. Also make the glaze but don't spread it over the buns. Step 4 - To assemble place one cake layer on a serving plate and pipe the glaze over the cake. Add the next layer and then pipe the rest of the glaze. Add the cinnamon buns on top. 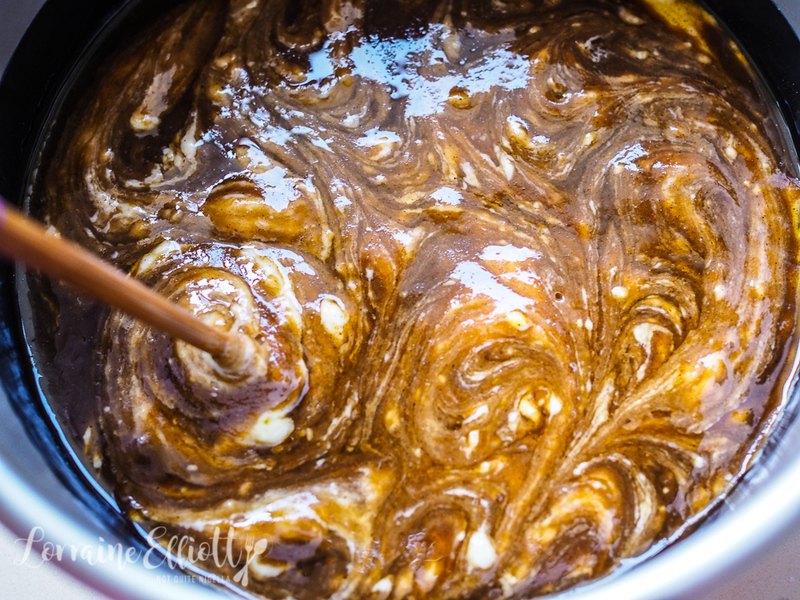 You can either dust it with icing or confectioners sugar or a bit more glaze. recipeCherry Spectacular Black Forest Cake! recipe Cherry Spectacular Black Forest Cake!